My project list for the summer is fast growing. I'd really like to add terrarium making to that list as I love the magic and whimsy of them. I always feel like I'm looking onto another planet, sometimes a rain forest, a dessert, and sometimes, even looking onto the land of little elves. I also think a terrarium in a beautiful glass vessel will look great as a present or housewarming gift, as I'm always looking for eco conscious and plastic free gifts for friends and family. Terrariums are also practically maintenance free, which make them a great choice for those friends with black thumbs. 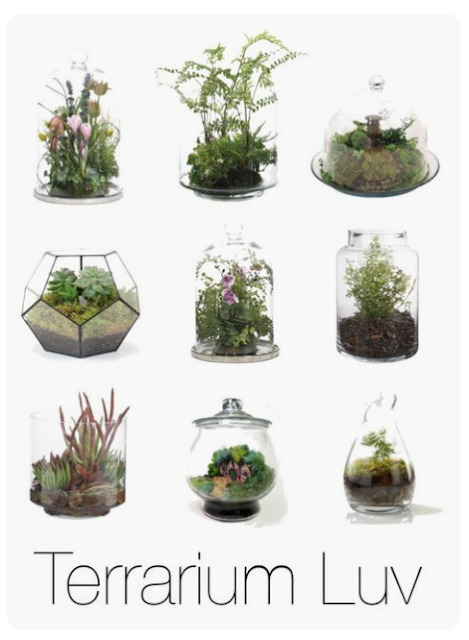 I've been reading up on the actual process, and making terrariums seems quite simple, which is why I have to add this to my summer project list (right now, simplicity is a top component of what projects I choose to take on). When I'm ready to make one of these babies, I will go here to follow the steps to make one, and will be sure to post about it. Till then, let me know if there are any eco friendly projects you would like to see me take on this summer.